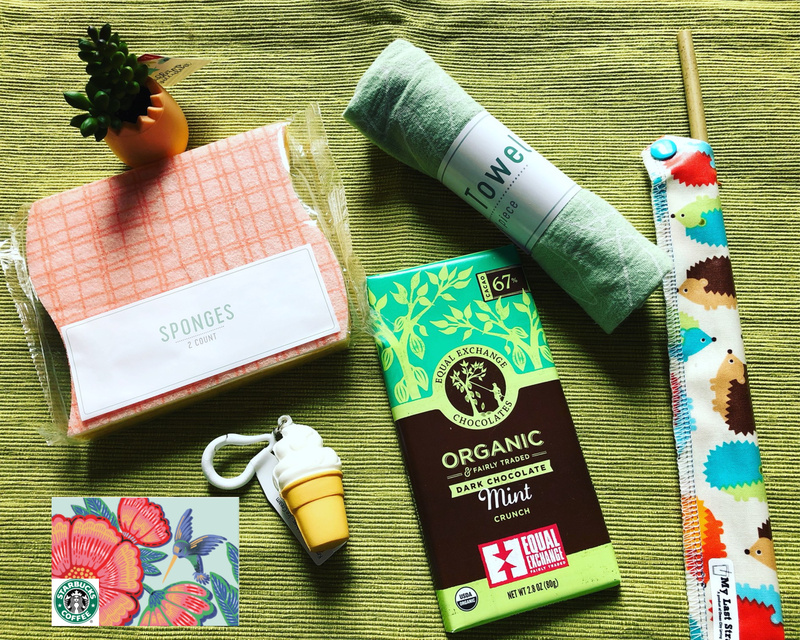 Happy Spring Happy Earth Month Giveaway! The weather has been wonderful and warm here in Colorado, but snow tomorrow. LOL! I love spring and the flowers blooming. April is also Earth Month. Check out my guest post at Green City Living on easy ideas you can do to start to become green. While you are there check out their April sales on handmade reusable items. They have many new products and I guarantee you will love them all! What do you have going on this month? 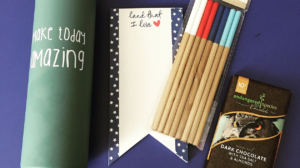 WIN $5 Starbucks, Chocolate, reusable Bamboo Straw from Green City Living + cute goodies you see here! This giveaway will end on April 23, 2019 at midnight MST. Winners will be drawn via rafflecopter. Once a winner is drawn I will contact them and they will have 48 hours to reply before I draw a new winner. Giveaway is open to anyone in the US. You must be 18 years of age or older. Giveaway is not affiliated with Facebook & I release them of liability. Winner will be posted in the rafflecopter widget. It’s HOT out there Giveaway! We are making a road trip from SC to Long Island in about 3 weeks. I don't have any plans but hopefully the warm weather will bring some fun adventures. No plans as of yet. No fun plans yet but do intend on redoing our front flower bed this year. Our plans for spring is to start our kitchen remodel and lots of decluttering! I plan on planting a big garden this spring. I use Hay Straws now and like them very much. They last about a week or less depending on how much you use them. I would like to try the My Last Straw Bamboo straw you feature here that looks much more permanent. Yard cleaning yesterday, snow tomorrow, lol. Can't wait for flowers! I am just planning on getting my gardens ready for planting. My teen will be giving me a helping hand during his spring break, a little unwillingly but he will, lol. I just have plans to plant flowers. I plan to garden this spring. I'm also hosting Easter dinner. My birthday is the end of this month, and I am traveling with my hubby for his job. It will be good to get away for a few days. Just excited to start the garden and Spring walks. We are looking forward to hunting for moral mushrooms this Spring. My plans for this spring is to go camping. Tons of things to do this spring! With 3 kids the possibilities are endless.... Crafts, picnics, sports, end of year school events, a few birthdays. "Any fun plans this spring?" Finishing up watching "Mary Tyler Moore Show" DVDs! I don’t currently have any spring plans. I’m pretty much in survival mode at the moment. I work in a garden center so spring is our busiest time. I plan on hanging out with the flowers for the next couple of months. No fun plans for the spring - yet. But I'm working on it! My grandson lives in Florida, and his bday is in the spring. We will be going down there to visit. We are coloring eggs and painting rocks. Nice family get together to celebrate Easter. No. We don't have any plans. I hope to play lots of tennis this spring! We are raising lambs and piglets this spring. We're planning my daughter's wedding! Not spring-specific, but I'm planning to move apartments within the next couple of months (during spring) and the preparations are taking most of my time. We have started working on our vegetable garden with the kids! That's the main reason I love spring. We don't have plans to go anywhere fun, but gardening and lots of spring cleaning! I want to plant flowers! I cant wait to get out there for bike rides and nature hikes! Headed out of town this spring for my nephews wedding. I am going on a cruise next week. Much needed after long hours of working. Just booked a trip to Denver for the summer. Can't wait to camp in Rocky Mountain National Park. We are going to be moving real soon! We are planning for family park visits this spring. No real plans right now. We had summer one day last week. It was fun while it lasted. LOL I'm antsy to get my feet in the grass and get my outside planters filled. Looking forward to getting the garden in. No, have to pain the house exterior. Not going to be easy. Yes !! We're going to South Carolina on vacation! I'm going to the zoo soon and love doing nature walks in the morning or evening during the spring. We have big tulip fields near where I live so my friend and I are going to check them out tomorrow and go to some plant nursery's. My little girl loves her egg hunts, so we are planning to do a couple of those before and during Easter. I'm looking forward to planting flowers this spring. I am starting to train for a marathon this spring! We are going glamping for Spring break! I am going to be celebrating my 21st birthday this spring! I'm looking forward to warmer weather. I can't wait to start gardening! So far just plan to plant flowers and do some spring cleaning. My sons first birthday is the 20th of April fingers crossed it’s a nice day! We are going to a couple of weddings. We are excited to finally go to the park and the zoo and play outside with the kids! My plans for Spring is to get my vegetable and herb garden planted. We are loving the warmer weather! Will be working on the garden. I am workig on my Spring garden filling it with herbs. We are getting our pool ready to open and we are going to plant our garden. This spring our happiest plan is that my sister is visiting from out of state to come with us to a family wedding. My special plan was attending my daughter's wedding which was last weekend. Nope no plans for Spring - we already had our spring break and are in the last haul of the school year! 6 more weeks! My plans include an expanded garden. So much fun, and good food, too! I'm excited to do a lot of hiking. Spending more time volunteering at the botanic gardens. Thanks for the contest. I plan on visiting my Aunt in Idaho this Summer. No travel plans until July. I guess our plans are to clean up the yard after winter and take down a tree that is getting in bad shape. We are also looking into having a new roof put on. We are liking the metal roofs. Expensive!!! My daughter has a couple of sports this spring. Nothing for me! My plans for this spring are to paint the exterior of my house and plant flowers. at More Crunchy Beach Mama! Crunchy Mail in your Inbox! HP Warehouse Sale + $500 Giveaway! Did you hear I live in the mountains now? My Fav Posts to Pin!